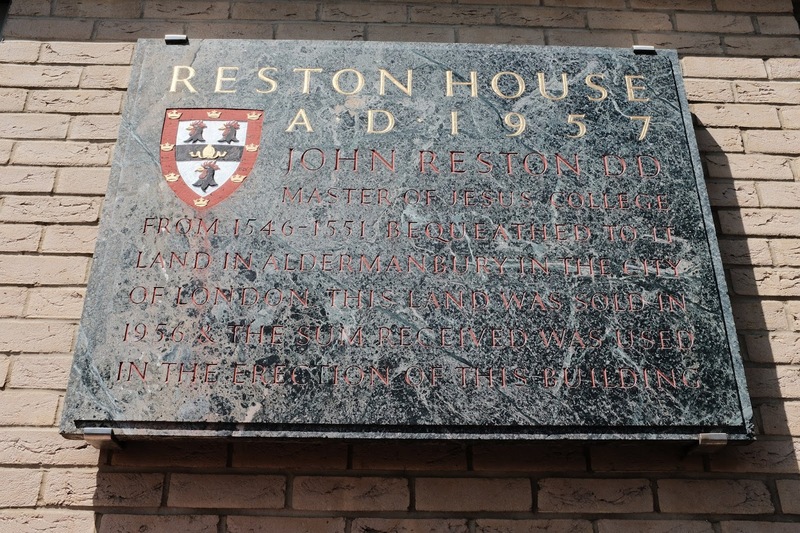 Reston House AD 1957 John Reston D. D. Master of Jesus College from 1546-1551 bequeathed to it land in Aldermanbury in the City of London. This land was sold in 1956 and the sum received was used in the erection of this building. Just a moment ago you will have heard (or read) Phil Smith’s “Starter Kit for Drifters: Five steps to a drift or dérive” and it was on one such drift that I first came face to face with the name of John Reston around whose memory this address pivots. But this is to get ahead of myself . 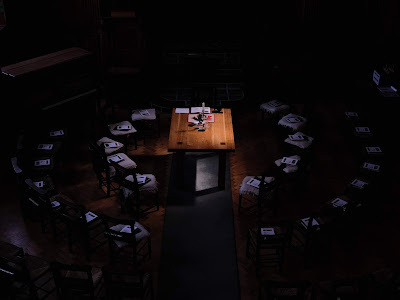 . .
I’ve long been acutely aware how our modern neoliberal culture — for all kinds of religious, political, economic and social reasons — quite deliberately present us with a world in which, to borrow words from one of its founding figures, Margaret Thatcher, there is no alternative (TINA). It’s a world of deregulated free-markets in which the status quo is endlessly maintained by those few to whom that status quo gives comfort and power, a world in which, to quote the famous, but utterly false words of Francis Fukuyama, history has come to an end — what you now see is what you’ll get, forever and ever. But, as we are now aware, history is back with a vengeance and many people — across the political spectrum — have woken up to the enduring truth which is that there is always an alternative — I cannot repeat this strongly enough — there is ALWAYS an alternative. But this important realisation cuts both ways and so one must always always ask “What kind of alternative?” The present, pressing task of a liberal religious community such as our own, with its radical, egalitarian and democratic tradition is, therefore, to make sure that when the dust settles the alternative we get is a better one than the hateful, nationalistic and potentially fascistic alternatives we are currently being peddled by far too many people in the USA, UK and Europe at the moment and about which I spoke and wrote about last week (HERE and HERE). How is this revolution to take place? Nobody knows how it will take place in humanity, but every man feels it clearly in himself. And yet in our world everybody thinks of changing humanity, and nobody thinks of changing himself (“Three Methods Of Reform” in Pamphlets, trans. by Aylmer Maude). To my mind, therefore, before we launch into the clearly necessary business of changing the world we need to change ourselves. One peaceful, enjoyable but nevertheless subversive and transformative way of changing ourselves is to start actively engaging in the kind of drifting outlined by Phil Smith. The simple hope is that it will help us begin to see more and more and more meanings and stories in the complex world around us and this, in turn, can help us resist the lie that is TINA and then to articulate alternative ways of proceeding that, we may trust, can bring about more hopeful, creative and healthy possibilities for our present and future being. So, what now follows is, if you like, a little local case study of drifting, it is, if you like, an après dérive in which I have made some small memento of a small drift to share with you in the hope that perhaps you might set of with me and/or others in new drifts . . .
Susanna and I often shop at the small Waitrose around the corner. It’s expensive but we continue to shop there because, not withstanding a few recent deeply problematic decisions made to outsource their cleaning to some problematic private contractors who would not pay the living wage, it is one of only two large chains of food shops that still has some real and meaningful co-operative basis where the store staff are themselves co-owners rather than mere employees. The building, Reston House, in which the shop resides is a typical early-naughties affair and, to my eyes, horrible. It is situated in an area of the Kite that was demolished at that time and although it is true that this area of the town was very run-down, those of you who were in Cambridge at the time will recall it was still a residential community which could have been renovated in a very different way. 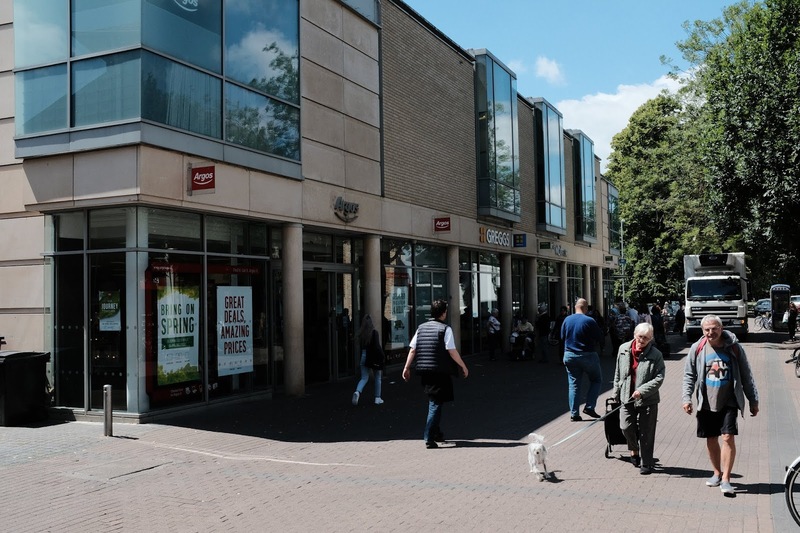 But the 1980s were a time when TINA was just beginning her free-market rule and so the area began to be flattened and become the pretty uninspiring retail quarter we now know and “love” (to hate). Anyway, every time I swing around the corner from Jesus Terrace into the precinct I try to remember to begin to drift and to do some opening up, to clear my eyes and to peel away “the layers of spectacle, deception and that strange ‘hiddenness in plain sight’ that coats the everyday.” As one drifts one is deliberately trying to disrupt one’s usual sleepwalking way of moving through the world so as to shake up things (and oneself) “so that rather than wandering ankle deep through the sediment of discarded images and illusions, one can explore the whole whirling snowglobe.” And trust trust me, there’s a whirling snow globe of stuff everywhere, and it’s certainly there in spades in this otherwise unpromising section of the city. However, of course, not every one of my walks to Waitrose is undertaken as a drifter, as a consciously subversive flâneur. Like everyone else I am at times prone to walk thoughtlessly through the world and so, every now and then when I awake from sleep in the middle of a thoughtless walk, I know I need to make a conscious decision to drift. So, a few weeks ago, having got to and shopped in Waitrose in just such a thoughtless fashion, as I left the shop for some reason I awoke — I don’t know why — and I decided to take myself home by turning right instead of left. Again, force of thoughtless habit almost made me walk on up to Eden Street where I could turn right again and stroll homeward along, what is to me a well-known and a pleasant old Cambridge residential street. So, instead I allowed myself to drift first right into Eden Street Backway. In so doing I was, of course, following Smith’s encouragement to “start in the familiar and straightaway head off into the unknown”. It also had the benefit of taking me into a road that, unless you had access to your property via it, you wouldn’t normally visit. So, there I was, slipping down an alley following my instinct and not a map and straight away I stumbled upon an intriguing concatenation of details to chase which can be seen in the picture you have in your order of service. It really is of the finest quality and is a piece of work that might be said to befit well the memory of a venerable sixteenth-century Doctor of Divinity. (I don't yet know who carved it but, when I find out, I'll add their name here). It seems to function as a kind of praise to this famous man, a man whom we may imagine was (or who, perhaps, believed himself to be) someone apportioned with great glory, who ruled in the kingdom of his college, who made a name for himself by his valour, who gave counsel because he was intelligent and, in the pulpit, spoke in prophetic oracles, who led the people by his counsels and by his knowledge of the people’s lore, who was wise in his words of instruction, who (perhaps) composed musical tunes or put verses in writing. He was certainly as the plaque indicates, a rich man endowed with resources who lived peacefully in his homes, who was honoured in his generation and was the pride of his times — or so we may imagine. But then there is the shock of the context in which the name of this famous man is found. It rather made me wonder whether, on balance, he might have preferred to have remained one of the unknown people mentioned in Ecclesiasticus! For starters there is the building to which it is attached. Surely no self-respecting sixteenth-century Doctor of Divinity would be happy with having his name attached to it? A small private chapel dedicated to the glory of God, a fine canopied tomb or even a magnificent stained-glass window, yes; but a poor-quality, aesthetically unpleasing early-naughties commercial build dedicated to the god of mammon like this one, well, no thank you! Then there were his memorial’s patient attendants, that charming bright red Biffa waste-bin and a pile of rubbish that the yellow sign tells us constituted an "environmental crime scene." 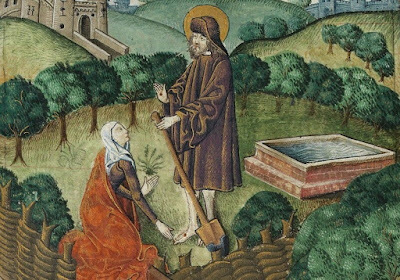 As far as attendants are concerned they are hardly of the holy, angelic kind you’d expect to find in that hoped for private chapel, attached to that hoped for canopied tomb or depicted in that hoped for stained glass window, are they? I stood there for a good ten minutes with questions just tumbling out of me. Here are just a few and by no means anywhere near all of them . . .
What do these things alone and together say about Reston and his life and hopes? 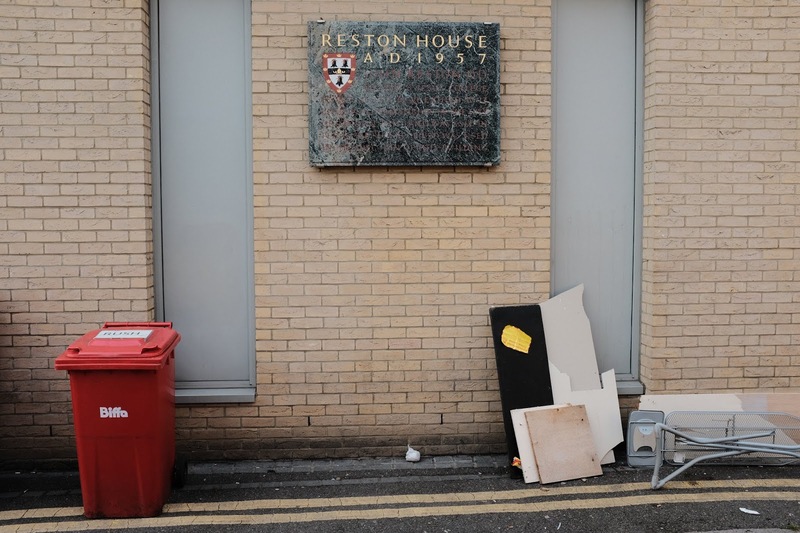 What does the monument and its placement say about his alma mater, Jesus College, and their values and ways of remembering — was this an ironic monument or deadly serious? What do these things alone and together say about this shopping precinct and the hopes and values of those who knocked down a living neighbourhood to build it and also about the hopes and values of those of us who find ourselves either thoughtlessly wandering or actively and consciously drifting through this haunted palimpsest of a place seeking (or not seeking) new, alternative ways of being in the world? And on and on I could go . . .
As Smith observes, one is looking for “traces of rebellion or snuffed-out difference, for wormholes, for powerful symbols, for voids, for where things are interwoven.” In my opinion it is in engaging in this kind of mythogeography that we can affect deep changes in ourselves out of which alternative — and dare I say it, better — futures may be born that can avoid some of the worst mistakes and excesses of our pasts and presents. Remember, too, that if the drift diverts you onto another theme, that’s fine — this reminds us of the discursive interconnectedness of reality, of the world. So, for instance, the mention of Aldermanbury caused me to check (on my iPhone as it happens) just exactly where it was and something of its history. It’s an area of London just north of St Paul's and I quickly stumbled on the story of how the walls of St Mary’s church there, which was destroyed by the Blitz in 1940, were transferred to Fulton, Missouri in 1966 and rebuilt in the grounds of Westminster College as a memorial to Winston Churchill. Churchill, you may remember, made his “Iron Curtain” speech in the Westminster College Gymnasium in 1946. Churchill, therefore, got a grand memorial out of the razing of Aldermanbury in a way John Reston seems not to have got a grand memorial out of the razing of the old buildings in the precinct where his own memorial has been built. What do these things tell us about the way we view different causes of destruction, rebuilding, building anew and the act of memorialising them all? However, here I leave all these questions deliberately unaddressed, raising them is sufficient to my task today. And the point of this kind of drifting? Well, at a certain level, there need be none. You can simply just enjoy the activity for what it is. But for me what “drifting” provides are “hooks” upon which a person may hang important political and religious ideas and narratives. The trouble with most political ideas and narratives today is that they are often offered only in the abstract and people therefore often don’t have anything real and experiential in themselves upon which they can hang them. If you like, many of the religious and political ideas a person receives today merely ends up in a jumble on the floor of their inner “cloakroom”. However drifting can provide all kinds of hooks in the form of this or that story of “traces of rebellion or snuffed-out difference . . ., wormholes, . . . powerful symbols, . . . voids, [and] . . . where things are interwoven” and, in turn this may mean many more political or religious ideas have somewhere to hang, ready for use, in the depths of the same person . . . . or at least that’s my basic claim/hope. To me drifting can be a profoundly transformative political and religious practice. It is a way of being in the world that serves powerfully and regularly to remind a person of the multifarious nature of reality and that there are an almost countless number of alternative ways a person might celebrate, express and weave them together. It’s an activity which stops a person from being tempted to believe the lie that the world is something that can, or should be, seen and lived in in only one fashion to which there is no alternative. In short drifting is an activity which can peacefully, provocatively, creatively, subversively and enjoyably help to open a door so a person can see there are always before them a variety of possible, alternative futures. It’s then up to we drifters together to find ways to celebrate, express and weave what we find on our drifts into a world filled with more kindness, justice and love than the world in which we currently find ourselves. So, to conclude, in these strange and dark times I invite you to drift with me and each other now and then and to let this subversive, transformative activity open up all kinds of cracks and wormholes all around us that might be widened to let in new futures full of new lights and truths. stories and ideas to explore. for accounts of drifts undertaken by Phil and others.